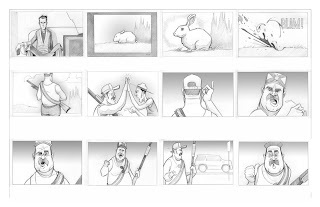 Here are two sets of storyboards for project Q. Storyboards are a relatively new endeavor for me and I'm finding them challenging and rewarding. I'm a major perfectionist. I tend not to be satisfied with a drawing unless every detail has been considered and addressed. 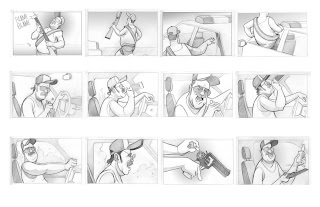 This is the opposite of what's need with a storyboard, which is simply a means of conveying angles, compositions, and action. So it's difficult for me to let go of a drawing that's little more than a sketch (rife with proportion and scale problems, sloppy lines, and off-model characters). They certainly make me feel as if I've accomplished something, though. And it's good for me once in a while to allow 'good enough' to be good enough.